1. Keoladeo National Park: The Keoladeo National Park is the ideal destination for birdwatchers. It gets its name after a temple of Lord Shiva. It is just 29 sq. km. in area… but do not get misled by how small it seems, once you get inside you’ll find it to be an endless haven of beautiful birds and trees. 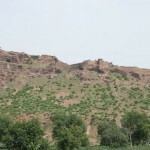 In fact, in the olden days it was a royal duck-shoot reserve and Maharajas would lead hunting parties here. Then, in 1956, it was declared a wildlife sanctuary and upgraded to a national park, perhaps the smallest, in 1981. India is truly blessed with great biodiversity and Keoladeo is proof of this. About 20 percent (approx. 400) bird species have been reported from this small area which is geographically several thousand times smaller than India! The mosaic of habitats that Keoladeo offers is the reason for this. About one-third of its area is a wetland and the rest is scrub, woodland and grassland. 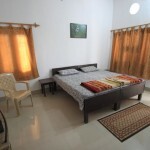 Keoladeo is regarded as one of the finest heronries in India. 20 species of storks, herons and egrets breed here in the month of monsoon (July-September). About one-third of the avifauna are residents and an equal number are migrants. Some others are local, summer or passage migrants. The park is a favorite destination for bird photographers. There are a variety of habitats and life forms here. A large network of roads and dykes makes all nooks and corners of the park accessible to a wildlife enthusiast. One doesn’t need permissions or hiring of costly vehicles to move about. Moreover it is quite close to town so one can conveniently make any number of visits. One can hire a bicycle, a rickshaw or can even enjoy watching the park’s wildlife on foot. So ‘small’ is not only beautiful but inexpensive and convenient as well! 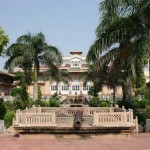 Keoladeo park is popularly know as ’bird paradise’. Over 400 bird species have been recorded in the park. Mammalian fauna of KNP is equally rich with 27 identified species. (Amphibians & Reptiles) Herpetofauna of KNP is very rich. Out of the 10 species of turtles that are seen in Rajasthan , 7 are present in the park. 2. National Chambal Sanctuary (120km from Bharatpur): The National Chambal sanctuary is famous for the rare Gangetic dolphin, gharial and crocodiles. The Chambal River passes through three states: Rajasthan, Madhya Pradesh, and Uttar Pradesh. The Sanctuary was first designated as a protected area in 1979 in an attempt to revive the Gharial population from ongoing poaching. It covers a 400 km stretch with a 1-5 km stretch of mud cliffs on both sides of the Chambal river ravines. Total area of 1235 sq. km. is protected in the National Chambal Sanctuary. Chambal supports 8 of the 26 rare turtle species found in India. Chambal supports the largest population of Gharial in the wild. 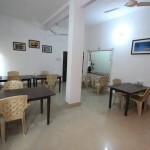 One of the few places to support the Gangetic dolphin. Only known place where nesting of Indian Skimmers is recorded in large numbers. Chambal supports more then 320 resident and migrant birds. National Chambal Sanctuary is a 2-hour drive from Bharatpur. 3. 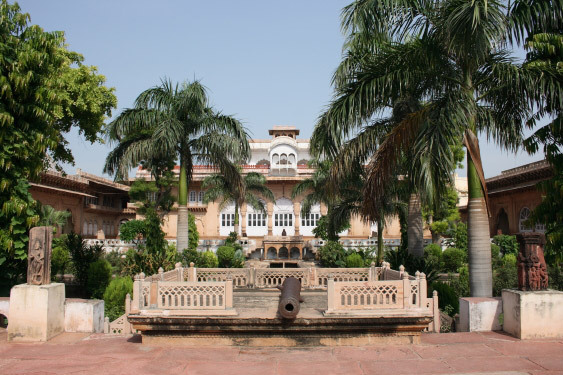 The Palace: It is a fine blend of Mughal and Rajput architecture, built in various phases by different Maharajas. The magnificent apartments are richly decorated with patterned floor tiles with exquisite intricate designs. 4. 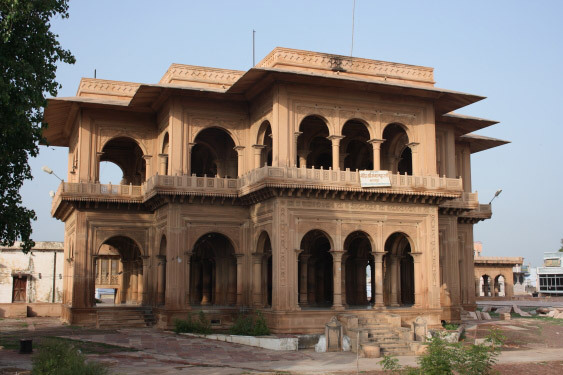 Ganga Mandir (Temple): The construction of this big temple was started by Maharaja Balwant Singh in 1845. 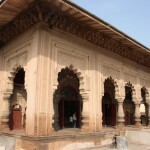 The constructions were made by a unique method where all persons employed in the services of the state, were asked to donate one month salary of their service or any rise in pay towards the shrine. The temple is a beautiful architectural marvel. 5. 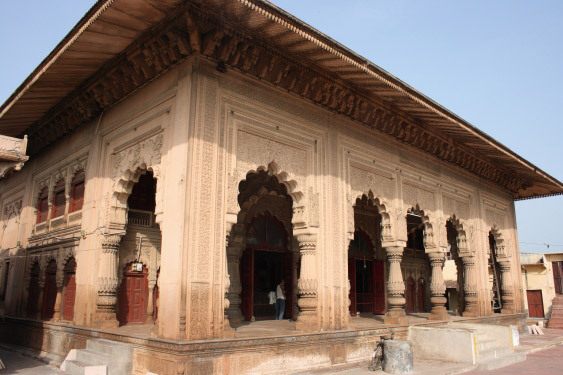 Laxman Mandir (Temple): This temple is famous for beautiful stone work with elaborate carvings, from doorways and lentils to ceiling, pillars, walls and arches. This temple is dedicated to Laxman, the brother of Lord Ram. 7. 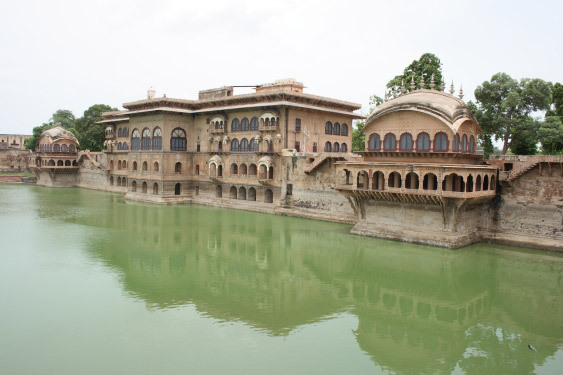 Deeg (34 km): North of Bharatpur is a beautiful garden town, the gardens have been laid with great care and precision, the sparkling fountains and meticulous palaces add to the beauty of this idyllic retreat of the princes of Bharatpur. The tourist enjoy the charming settings of this agricultural town, along with the well preserved palace pavilions and gardens. 8. 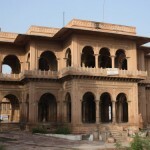 Bandh Baretha (60 km): Bandh Baretha is an old wildlife reserve of the rulers of Bharatpur. 9. 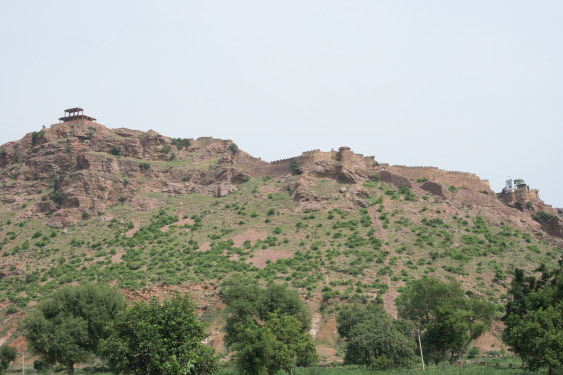 Byana (45 km): The famous fort known as Vijay Garh was built by the famous Hindu king Banasur, in the time of Lord Krishna and was renovated by Maharaja Vijay Pal .